Volkswagen is giving its German workers nearly a month off over Christmas and the New Year in the wake of an emissions scandal that has hurt sales and staff morale. A spokesman for the automaker confirmed that production at all Volkswagen's plants in Germany would cease on December 17 and resume January 11. 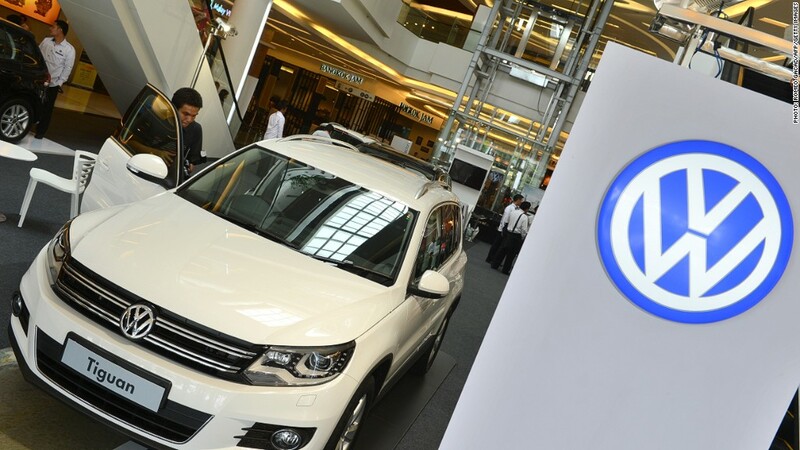 The one exception will be lines producing the new generation of its Tiguan SUV -- they'll close on December 21 and resume output on January 4. The company typically shuts down in Germany between Christmas Eve and New Year's Day, although the exact length of the holiday can vary from year to year. Volkswagen (VLKAY) employs nearly 600,000 people around the world, more than 250,000 of them in Germany. Volkswagen said its Chattanooga, Tenn., plant will be unaffected by the German shutdown. "Volkswagen Chattanooga has not altered its planned winter shutdown schedule. We are still ramping up the new Passat line while simultaneously construction continues for our new midsize SUV which will begin construction late next year," VW spokesman Scott Wilson said. The spokesman for the German operations said the main reason for the longer German closure this year was that most plants had already achieved their production targets for the year, but market conditions and the need to carry out maintenance work were also factors. "It could be the case that maintenance is needed, although the extent of the halt seems to imply to us that VW may also be preparing itself for potential sales declines," noted Timothy Rea, an auto analyst at BNP Paribas. He called the move "prudent." Volkswagen's spokesman said the company had taken recent events into consideration when deciding to extend this year's holiday. "We would like to start 2016 in a good mood," he said. Sales of Volkswagen cars fell 5.3% in October, the first full month after it admitted rigging pollution tests on as many as 11 million vehicles around the world. It was forced to halt sales of some models after the scandal broke in September. Globally, it sold nearly 30,000 fewer Volkswagen branded cars in October compared to the same month last year. The scandal has deepened since then with the admission that the company may have understated fuel consumption and carbon dioxide emissions for about 800,000 vehicles. Volkswagen has estimated the emissions scandal will cost it at least 8.7 billion euros ($9.2 billion), and it has already slashed investments for 2016 by one billion euros.